Use your college network user name and password. One search box automatically suggests keywords based on what you type, across all categories. Just type into the search box and see the keywords that will provide the most results. A SINGLE PAGE OF RESULTS. Instead of clicking through pages of results, scroll. 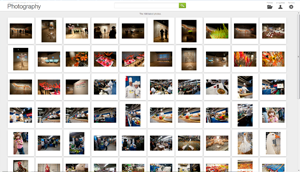 Find image groups and patterns, see more detail, or chose the perfect balance for you. Drag the slider left for smaller images, right to enlarge. dark light Click the light or dark buttons to change the background. Save (or remove) your selections to any of your folders with one click. Share folder access with colleagues. Allow them to add or remove photos and edit folder notes for streamlined collaboration. No limit on the number of folders; you may have as many as you care to manage. Add folder notes to remind you of project details. 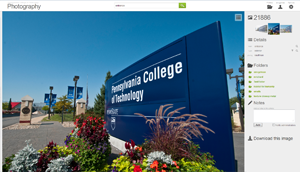 This is a compilation of digital photographs intended for use by Pennsylvania College of Technology, and maintained by the Public Relations & Marketing office. Faculty and staff are invited to view the database and choose images for their educational and promotional (publication and website) needs. Images in the database are optimized for browsing and are not appropriate for direct printing or insertion. To request actual photo files, use the "request photos" option within the database or e-mail photos@pct.edu. The database is for employees' use only - for help in selecting images for promotional purposes. We do not intend for access information to be shared with anyone who is not a Penn College employee.